There’s a tall man standing right outside my window; a tall, slender, faceless man — yet he is still watching. The Slender Man, or Slenderman as he may be known, has been a bit of a horror enigma for the past half of a decade. Created in 2009 almost by accident, the internet latched onto this creepy looming figure and have subsequently imagined up a character who’s origins are now just an amalgamation of internet fiction. That’s the eeriness of Slenderman. He is moderately different for everyone and in every story. But this is also the internet, which is fleeting, and the relevancy of this creepy figure is being questioned by some. The game starts out in daylight. You are next to a car that is blocked from going any further down a forest road, so naturally you must walk. The first thing I noticed was that the graphics failed to impress at all. However, I know that graphics don’t determine if a game is good or not, so I bravely pressed forward. I walked around aimlessly for a second, as some creepy drumbeats started to play and the sky began to darken. Okay, this seems like it’s setting up some atmosphere. Pausing the game tells me that my objective is to get to Kate’s house. I could see some lights through the forest, but the road seemed to take a round about route to the house. “Screw the road,” I thought, and headed straight through the forest towards the house. In fact, this first chapter is slowly paced, and while I expected something to happen, nothing ever did — until the scream. Slender: The Arrival borrows the horror gaming convention of arming you with nothing but a flashlight and the ability to run. 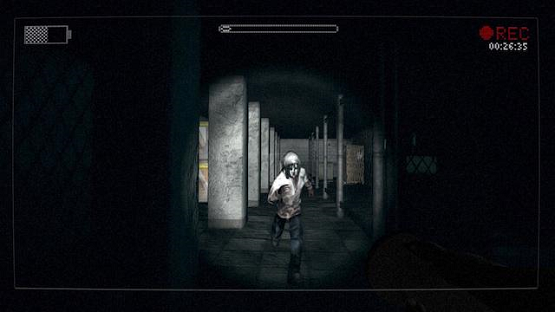 The game’s HUD is also set up to look like you are looking through a camera, mimicking “found footage style” horror movies, as well as games like Outlast. Yes, I am aware that Outlast technically came after Slender, as this PS3 version is a re-release, but Outlast just uses these horror game tactics to a much better end than Slender does. After going through Outlast and P.T., and seeing the reformation of horror games coming to us soon with titles like The Evil Within and Alien Isolation, I can’t help but feel that Slender: The Arrival is a seriously dated affair. While I started off creeped out, that feeling quickly dissipated into a bored expectation of what was to come next. Walking through a forest as my controller starts to shake and the visuals begin to distort meant that Slenderman was near. If I saw him looming before me, I would simply turn and walk in the other direction until the effects wore off. The first couple of times made me jump a little and fear making the trek off into the dark again, but the repetitive and expected patterns soon had me running through dark areas, simply veering off to each side anytime I detected that he might be near. Remember how scared you were of walking through the hallways in P.T. for fear that Lisa could be breathing down your neck? Well, Slenderman ought to take some lessons from Lisa for his next outing. This monotony lasted throughout the entirety of the game’s experience, which was less than two hours total. In fact, there is a speedrun trophy for finishing the game in under 45 minutes, if that is any indication of how long this game actually is. The story that is told is heavily veiled behind collectibles and sparse documents, and must be inferred. Without these (and even with them), I found myself questioning who I was as the player character, and what I was doing running around in these random forests, mines, and burnt out, abandoned buildings. 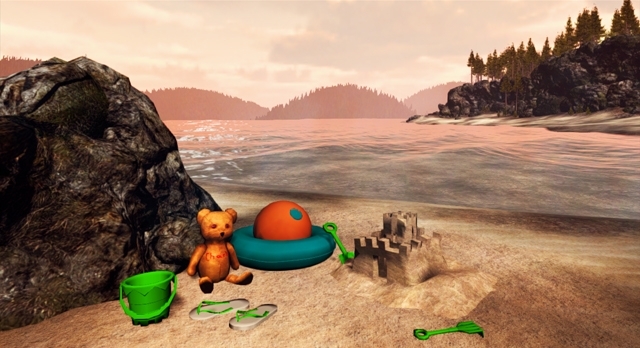 And with each new environment, the mechanics proceeded without evolving or adding any inherently new elements, which is perhaps the worst pattern that a horror game can fall into. At one point, you will find yourself faced with a being that is not Slenderman, which again, managed to give me a strong jump scare when I was first attacked by it without warning, but grew increasingly less frightening and more predictable as I continued on. Slender’s mechanics also lend to frustration, which tends to override any ambient terror that may be present. When I am being bombarded by invisible walls and poor collision detection on objects in the world, I can’t be bothered to be scared. Add back into all of this the graphics that even look quite dated for a PS3 game, and you have a recipe for a game that is more frustrating than frightening. It simply feels like cheap thrills designed around the enigma of Slenderman and capitalizing on the relative success of the original Slender: The Eight Pages. Yet, just by being a sequel, it fails to capture what made the original such a cult hit. It’s like trying to make a successful sequel to Fight Club. Some jump scares and the occasional bit of eerie ambiance are not enough to save Slender: The Arrival from a pit of predictability and low production value. What starts off with potential ultimately fails to rise above its own early conventions and provide horror fans with the experience that they are craving. If you are a die hard Slenderman fan and must experience this game, you may find some short lived entertainment here, but my experience felt dull and empty, choked by common tropes, and devoid of anything to raise Slender: The Arrival to the level of other horror titles. That tall, faceless man standing at my window? He doesn’t scare me at all. Slender: The Arrival review copy provided by publisher. For more information on scoring, read our Review Policy here. The creepy ambiance in some areas offers a glimmer of promise. The whole thing feels empty. Relies on repetitious scare tactics that grow predictable. No reason to push forward.